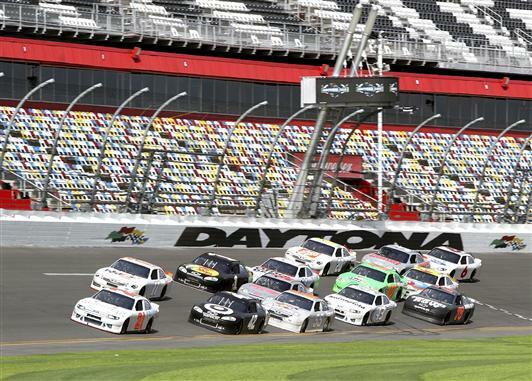 More than a month before Speedweeks open the 2012 NASCAR Sprint Cup Series at Daytona International Speedway, deals are coming together assuring to normally competitive field of cars for the crown jewel Daytona 500 race on February 26th. For others within stock car racing, the off-season consists also of a time where drivers and teams plan for a season of 36 races. In a bizarre off-season move that erupted after from the actions of a disgruntled Kurt Busch, the 2004 NASCAR Sprint Cup champion was removed from his #22 Penske Racing Dodge moving to the #51 Phoenix Racing Chevrolet team. A domino effect saw AJ Allmendinger joining the Penske Racing stock car team while 2011 NASCAR Nationwide Series runner Aric Almirola takes over the vacated #43 Ford Fusion at Richard Petty Motorsports. As of mid-January, 39 driver and team combinations are expected to run the 2012 Daytona 500. Listed below a list of confirmed entrants includes a select number of expected part-time runners including the #6 Roush Fenway Ford being driven by Ricky Stenhouse Jr. Among the confirmed list is 30 NASCAR Sprint Cup teams that are guaranteed to run the first 5 races of the 2012 season on virtue of placing in the top-35 in car owner points. Still unable to find a new owner or investor, two of the vacancies in the top-35 cars in the Team Red Bull racing team. Approaching the Daytona 500, the team campaigning two Toyota Camrys last season is completely silent. While the arrangement for the #4 car driver Kasey Kahne to move to Hendrick Motorsports was orchestrated in 2010, Brian Vickers (Team Red Bull pilot since the organization's inception in 2007) is still without a seat for the Daytona 500. Kahne and #4 Team Red Bull car's victory at Phoenix International Raceway late in 2011 appears to be a last effort for the group. Heading into February, it remains a possibility that some or all of the 5 cars remaining as part of the top-35 will be romanced by new teams to relinquish their guaranteed starting spot. If the car owner spots in the top-35 remain unused, the active teams down the list of the 2011 NASCAR Sprint Cup car owner points will inherit the sought-after honours.